I only knew the moment I signed my first contract. Greatest racing memory: It has to be my first professional win at the Tour of Qatar in what was only my second race a professional. I won against the guys who up until that point I had only seen on TV. Francisco Ventoso is one of the most experienced riders in the peloton with 15 years or pro racing in his legs. He has multiple grand tour stage wins at the Giro d’Italia and Vuelta a España, and 27 pro wins in all. Many of those have been on home soil at major Spanish races such as the Vuelta a Burgos, Vuelta a Castilla y Leon, Ruta Ciclista del Sol, and Vuelta a La Comunidad de Madrid. 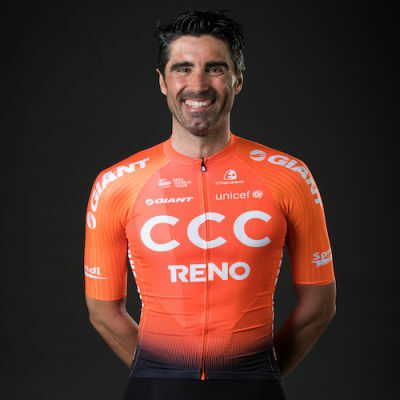 In recent years the former Spanish national road race champion has assumed the role of key domestique at one-day races and grand tours. With 35 monuments to his name, plus 15 grand tours, Ventoso plays an important role in CCC Team’s ambitions.